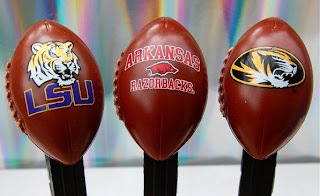 Here are the new college footballs for 2009. (Altho' we still have not obtained Utah and the 2 Washingtons from last year.) I'm thinking these will be HTF outside of Louisiana, Alabama and Missouri. I hear this single Batman is HTF too! 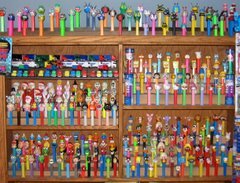 This WALL.E Pez had to be donated in Jeffers honor... since it is his favorite movie. Now EVE - donated on Sarah's b'day is back with her companion. We were in Portland for Father's Day and Dad got what he evo' wanted - the new ICE AGE 3 characters.